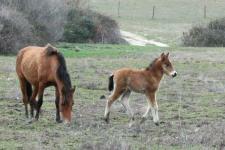 Two Returta foals were born in Western Iberia. The birth of these two foals is a great demonstration of their adaptation to the dehesa they live in. Last summer twenty Retuerta horses were transported from the Biological Station of Doñana to Campanarios de Azaba Biological Reserve in Western Iberia. The creation of a new herd of Retuerta horses in Campanarios de Azaba is a guarantee of survival of the rare race. The horses are one of the herbivore species that were brought here to restore the process of natural grazing. The transport of the Retuertas from Doñana Biological Station to Campanarios de Azaba is part of the cross-border Rewilding Europe project Western Iberia. The Western Iberia program was developed in 2011 by the Fundación Naturaleza y Hombre (FNYH) in Spain and by the Associaçâo Transumância and Natureza (ATN) in Portugal.